A couple of readers emailed me to say that the video in my last post did not portray the actual drone itself. I had intended to include a photo of the drone, but, maybe due to my age, completely forgot to do it. I still haven't taken a picture of my drone, but for those of you still curious about it, it's website is here. Here, however, is a video (by Grandma C) of me flying the drone. It may look like I was in complete control, but I can assure you I was not. The wind, I think, was blowing the drone to the left of screen, towards the trees; and I was keeping the drone lower down so as not to get it caught up in the higher branches, as I am in no condition to climb trees! The durian coffee also generated some interest and I have actually found that Grandma C did purchase another brand of that delightful drink, when last in Singapore. This one states that it is a "3 in 1" coffee, whereas the one in my previous post was a "4 in 1". They both tasted about the same, though. What the missing ingredient is in this one, I don't know; probably just another carcinogenic chemical! Used to imagine a drone has wings like aeromodel planes. Does it make a droning sound? The technology is amazing - years ago model aeroplanes used to require petrol. Can imagine wars of the future will be fought between drones. I guess "4 in 1" means coffee + sugar + creamer + durian. So "3 in 1" should mean either one of sugar or creamer is missing. Is it possible to tell by looking or tasting it which one is missing? From memory, the ones the US use to kill people in news videos are fixed wing ones. My drone creates its own wifi zone, and my smart phone links to this via its app, which is used to control the drone. The range is 50 metres. Re the coffee, the taste is remarkably similar. The list of ingredients is in too fine a print, even for my rejuvenated eyes. The technology is amazing... Arthur, it looks like you really like this coffee. Have a great weekend! haha, you've found my weakness, Reader's Tales. Have a great weekend yourself. Yes, I am, Reader's Tales; thanks for asking. Just being lazy about updating my blog. i found your sentence that due to AGE you forgot it ,it means i am far older than you ! new thing to me dear friend we have here only the dark brownish . hope your weather is going pleasant and your favorite coffee is pleasing your moods ! Our weather is a bit strange at the moment; one day it's 37°C and the next it's 20°C!! I prefer the cooler days. Oh? Another brand? I wonder what the combo tastes like coffee and durian. Old school style, they liked to add butter to hot coffee, let it melt and drink. I think there are people adding chocolate too. I'd go for our local charcoal fire-roasted-with-butter coffee, black, unadulterated, extra strong...and no milk nor creamer. I remember the coffee shops adding a slice of butter to coffee. I think they still do it. 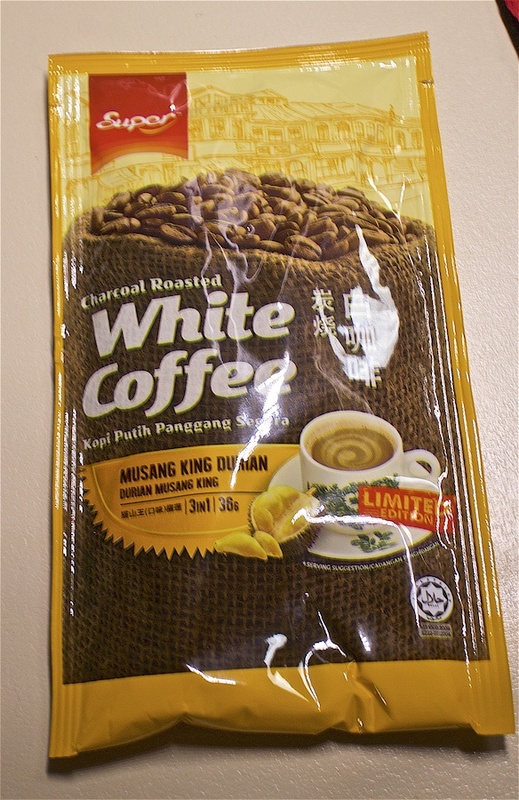 As for the durian coffee, it's very pleasant - the coffee adds a touch of bitterness to the sweet durian. Both brands taste about the same to me.